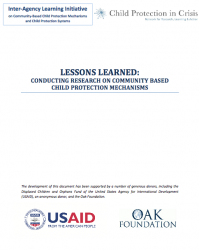 This guidance is a product of discussions by members of the CPC Network PLGs in Uganda, Sierra Leone and Liberia on lessons learned from the research conducted on community-based child protection mechanisms. It compiles insights from the three days of reflection, dialogue and consensus building. It is intended as an aid for other groups and initiatives in the planning and execution of ethnographic research on community-based child protection mechanisms, and to assist the learning of other groups and initiatives that study community-based child protection mechanisms. It is structured by three themes that guided the group discussions at the Monrovia workshop: 1) Preparation and Planning, 2) Data Collection, and 3) Data Analysis and Reporting.